25 Large Faceted Lava Nugget Beads - Heavy! Price is per 16-inch strand of these beautiful black beads. Each measures 16mm x 16mm x 12mm - about 25 nuggets to the strand. They are a new type of jewelry-making gemstone that is becoming increasingly popular. Everyone who makes and sells home-crafted jewelry should try some. The inexpensive stone is surprisingly light, making the present fashion for large chunky jewelry, comfortable to wear. The chic usually-black beads are also available in many different shapes and sizes allowing creative designs. Some are even dyed brown, and others brighter colors. Lava beads started life as molten rock over 1,000 degrees Celsius. It takes this high temperature and huge pressure to make rock melt beneath an active volcano. Most rock deep inside the Earth's interior is not molten. This molten rock is spewed out of the erupting volcano and flows in streams until cooler air freezes it solid. Sometimes the flow can travel as fast as 30 km/hour on steep slopes and reach tens of kilometers, destroying everything in its path. However, usually it moves less than 1 km/hour, giving people time to move out of the way. 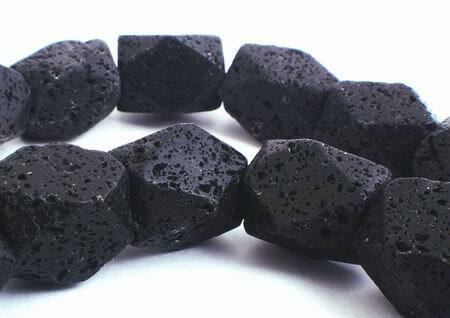 Properties Lava beads promote strength and fertility. Bringing stability in changing times, driving away anger - and helping one to understand a problem in order to spring back to a stronger position. A very grounding stone that strengthens our connection to Mother Earth. Beads from these rocks make very unusual jewelry. Used as pendants or parts of a necklace, these unusual black beads ooze style and mystique, drawing attention whenever worn. When admiring lava bead jewelry, people will ask, "whatever is it made out of?" This ensures all the mystique and power of a volcano are in your design! Take advantage of how light these beads weigh, and try making long earrings to match large lava bead pendants for necklaces and bracelets. Mix different sizes and shapes to make the design interesting. Because most are jet-black, they go well with any color or style of clothes, making them more appealing, and so easier to sell. By their nature, these beads create an earthy rustic style - ideal for "wild" outdoor jewellery, especially for late-in-the year or Halloween. And as most are large and powerful in a design, you need fewer beads to make your piece, saving you money. Although looking coarse with tiny holes and cracks, most of these beads are polished to feel smooth, making your jewelry comfortable to wear.